Historic Twickenham is a wonderful location for sketching. It is on the river Thames and has alleys, museums, sculpture, boats and buildings of huge character in a compact area. Oh, and a rugby stadium. There could also be cranes – the steel rather than feathered variety. But there are plenty of our feathered friends on The Embankment where we’ll start the day. 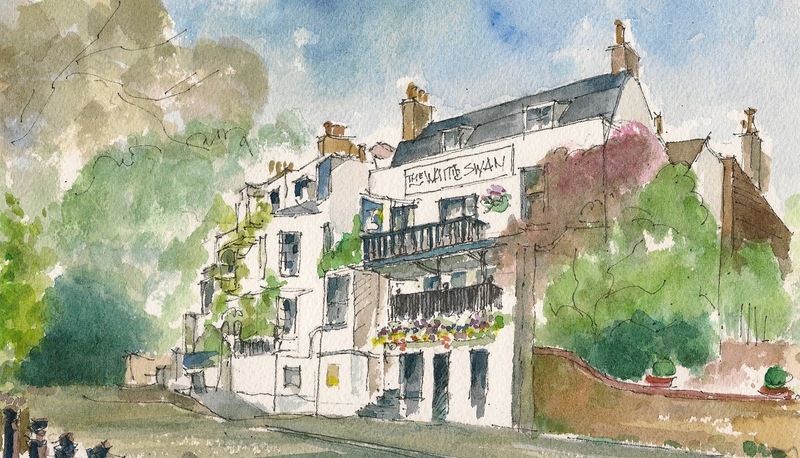 Then for those wishing to dally longer and share each other’s sketch books we will repair to The Crown pub, a short walk over the grass, or up Montpellier Row or Orleans Road, each worthy of a sketcher’s scrutiny. If the forecast is inclement then we’ll remain in the Twickenham town area with pubs, cafés and other shelter, meeting in The Eel Pie pub on Church Street. A decision on which option will be given at 11am and confirmed at 1pm. We will start the day on The Embankment where we will meet at 11am just below Café Sunshine. 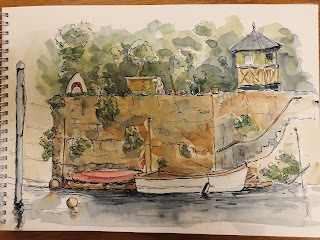 Opposite here is Eel Pie Island – a private island albeit accessible with discretion via a narrow foot bridge. Nowadays there are a rowing club, boatyard and moorings but it is perhaps better remembered (by some of us) for its 60’s heydays launching the likes of The Rolling Stones, Joe Cocker and Eric Clapton. 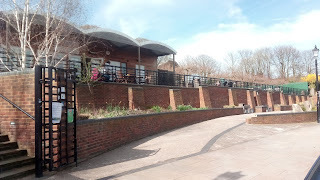 The recently opened Eel Pie Island Museum is nearby at 1 – 3 Richmond Road. That is opposite York House, the home of Richmond Borough Council. 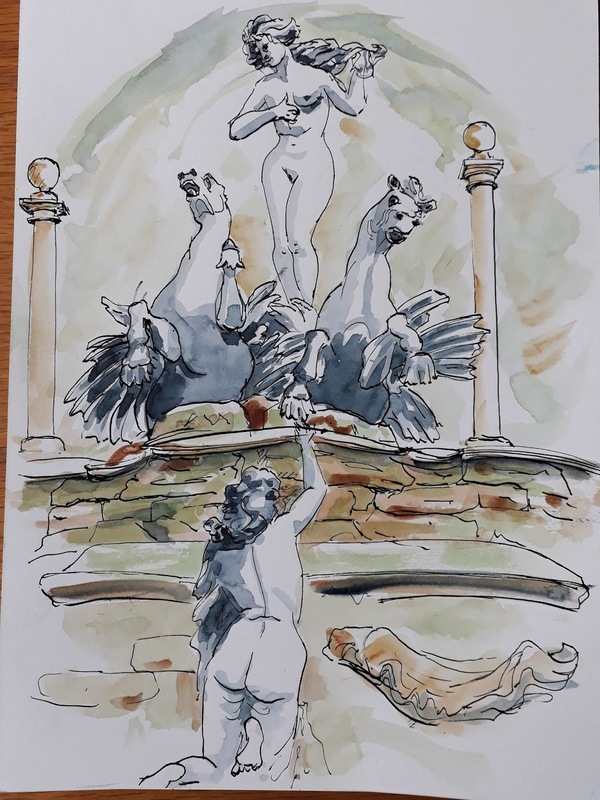 A fine 17th century building with, in its grounds, The Oceanides, statues by Oscar Spalmach (Italian, 1864-1917), who carved them in Carrara marble in the Roman studio of Orazio Andreoni at the turn of the nineteenth century. They are known locally as ‘the naked ladies’. There’s pretty Church Street with boutique shops and, on the corner with Church Lane, the Museum of Twickenham. And – you’ve guessed it – a church, St Mary’s. 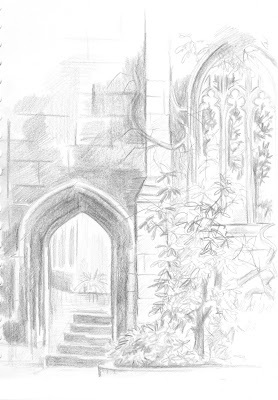 At 1:00 pm we’ll meet on the corner of Water Lane and The Embankment, using the curved steps to ‘show and tell’. Weather permitting in the afternoon we’ll sketch crawl along Riverside passing public gardens, Georgian Terraces, The White Swan . . .
. . . views over the River to Ham House, Orleans House, (home of the Borough’s Art Gallery), a café and exhibition/craft spaces. 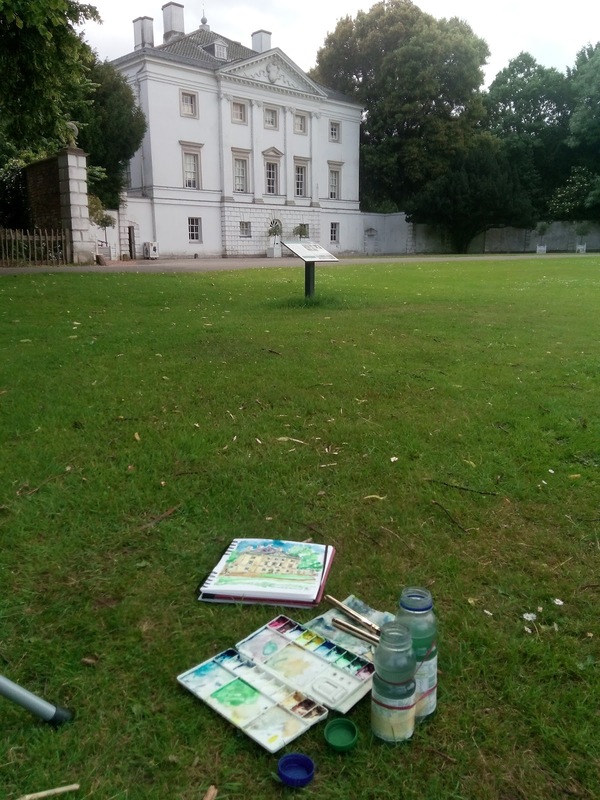 Thence to Marble Hill Park and Marble Hill House where we’ll meet again at 3:30pm outside the front (north) to ‘throw down’ sketchbooks. A further option for the day is an exhibition at the Orleans Gallery, Richmond: People and Places, which runs from 2 June to 19 August. 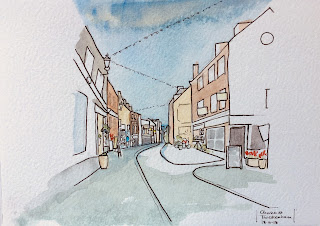 Several of our Urban Sketchers have had work selected. The nearest station is Twickenham, 5 – 10 minutes walk away. There are numerous buses from Richmond Station including 33, H22, R68, R70 and 490. Alight at York Street Twickenham. From Marble Hill House the nearest station is St Margaret’s, on the Waterloo line, or there are plenty of buses to Richmond. There are pubs, cafes and shops in the Twickenham town area. 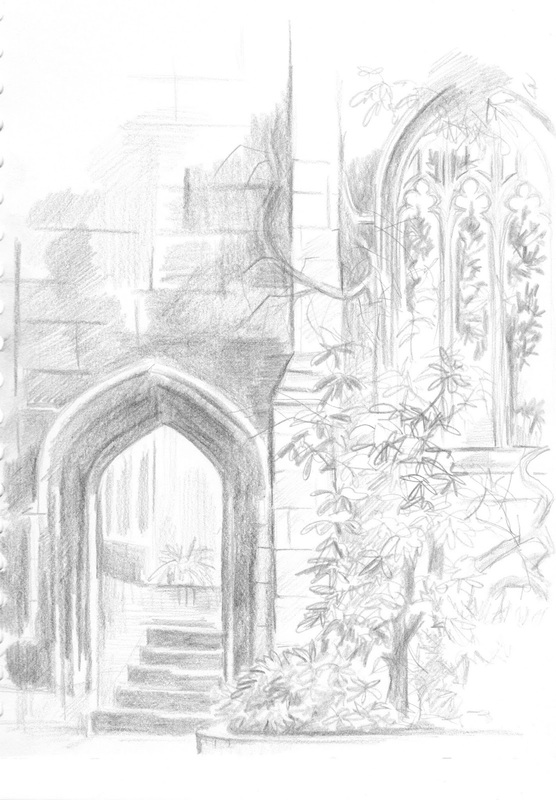 (Jo Dungey writes) The ruins of St Dunstan’s in the East now stand in a small public garden in the City of London. The church was severely damaged in the Blitz of 1941. The Church of England decided not to rebuild it, and it is now a quiet place to sit, midway between London Bridge and the Tower of London, on St Dunstan’s Hill. 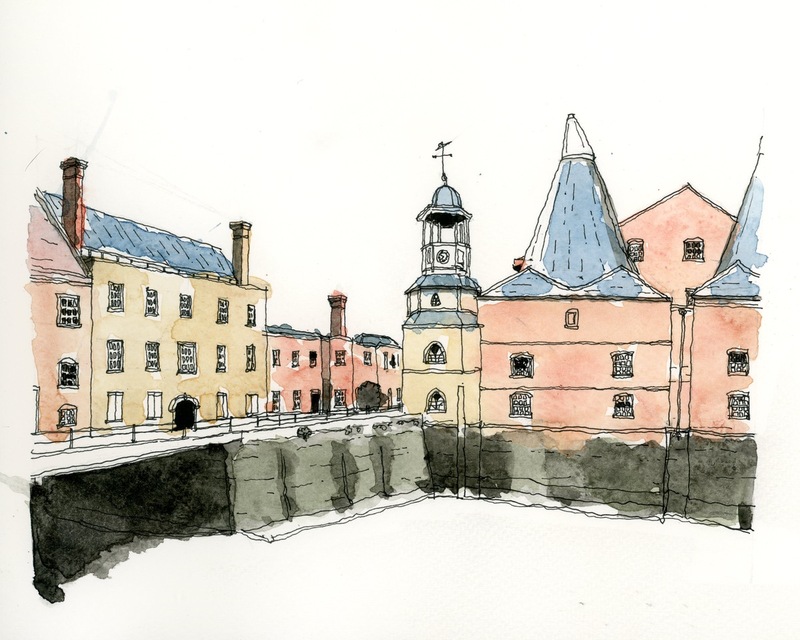 Join us to draw in east London at Three Mills Island – meeting on a Sunday this month. Three Mills is a unique site to explore and draw London’s industrial past. House Mill (1776) and Clock Mill (1817) are tidal water mills on the River Lea. 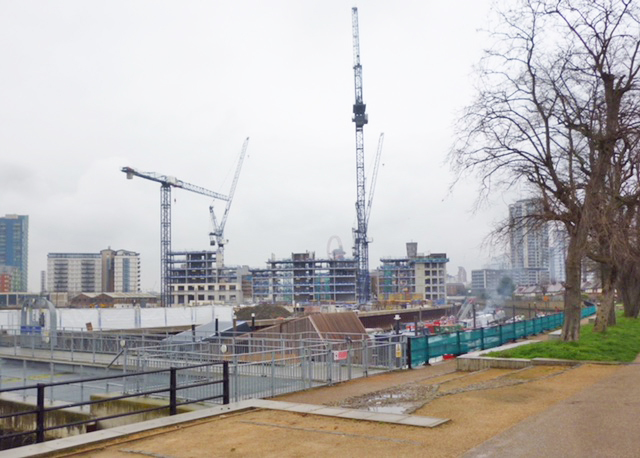 Also close by are the Bow Locks, and the area has river and canal-side walks and panoramic views of east London. 11am: Meet by the Clock Mill (see photograph above). Bring an umbrella if it is raining (the nearby café does not open until 11am). 1pm: Meet by the Clock Mill to look at drawings done so far. If it is wet, we will meet in the cafe of the adjacent House Mill. 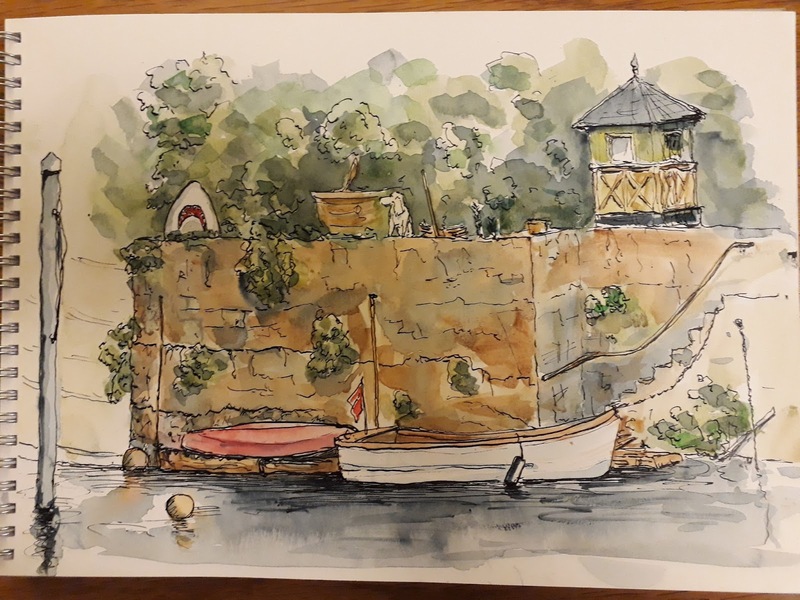 3.30pm: Meet at the same location, by Clock Mill (or the House Mill café if wet) to look at drawings we have done and take group photographs. 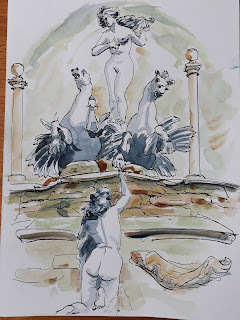 After this, we will go to The Galvanisers Union pub, 2 Devas Street (near Bromley-by-Bow Underground station) for refreshments, chat and sketchbook sharing. 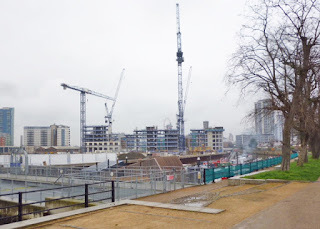 If we have bad weather: Three Mills Island has very little indoor or covered locations if the weather is wet. There is limited scope to draw from the café or from under nearby bridges. Guided tours of the House Mill are available, at £4. If the weather is wet, we will meet at Three Mills Island, as described here, from 11am to 1pm. If the afternoon is very wet, we may decide to move to the Museum of Childhood, in nearby Bethnal Green. We will decide this on the day at the 1pm meet-up. Views towards the London Olympic Park including the Anish Kapoor ArcelorMittal Orbit sculpture. There have been watermills on this part of the River Lea since the eleventh century – the Doomsday Book of 1086 records eight mills. The River Lea flows into the Thames and is part of the same tidal system; tidal mills use the flow of water to power the grinding of wheat into flour, and other purposes. The name ‘Three Mills’ was in use by the twelfth century; the mills ground and sold bread flour to local bakers. Grain was brought to the mills by carts or by barge from farms in Suffolk, Essex and Hertfordshire. Standing by the mills, you can see the tramways in the ground used by the grain carts. The House Mill we see today was built in 1776; the Miller’s House adjoining it was rebuilt in the 1990’s to the original 1763 design after damage from Second World War bombing. The Clock Mill was built in 1817, replacing a timber-built mill. 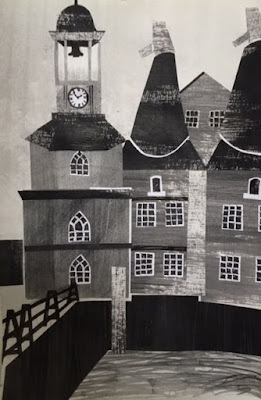 The clocktower is retained from the 1750s; the clock and bell summoned the local people to work at the mills. These two mills have waterwheels under the buildings which would have driven the millstones. The buildings with conical roofs were used to dry grain. In the eighteenth century, gin making developed here, using grain from the mills. What is now Three Mills film studio was a big distillery and bottling plant, making gin and bottling beer, sherry, wine and spirits. The Customs House next to the House Mill supervised the taxation of alcohol sales. Many industries developed in the Stratford and West Ham area which used the canals and rivers for transport. For example, in records of 1832, the main goods being transported were coal, malt, grain, flour and gunpowder. Abbey Mills Pumping Station was designed in 1865 by Joseph Bazalgette, as part of the improvement of sewerage in London. The House Mill was grinding grain until 1940, the Clock Mill until 1951. This is now a Conservation Area and the House Mills Trust plans to restore the mill to working order. At present, the remaining milling equipment and the watermills can be seen by taking a tour of the House Mill, which is kept open by volunteers, as detailed on the Trust’s website. The nearest Underground station is Bromley-by-Bow (District Line, and Hammersmith and City Line). The bus routes 488 and D8 also stop here. Leaving the Underground station, you face a view of dereliction, but don’t worry, it gets better. Turn left into the underpass under the busy A12, following the signs to Three Mills Lane. Follow Three Mills Lane passing around the left of a large Tesco store. Ahead you will see the Clock Mill on the other side of the canal. There are limited facilities for food and drink at this location, so you could choose to bring something. Next to the House Mill is a small café run by volunteers (open 11am to 4pm). There is a pub, The Galvanisers Union on Devas Street near Bromley-by-Bow Underground station which offers Sunday roast lunches and drinks (open 12 noon to 10pm). Nearby is a Sainsbury’s Local shop (open 7am to 11pm) and there is a big Tesco (open 12 noon to 6pm) between the Underground station and Three Mills Island which also has take-away coffee at its petrol station. There are toilets at Tesco, one at the House Mill café (for customers), and at the pub. This day is run by Martin Stone and Steven Baker. Photographs by Steven Baker, drawings by Martin Stone and Steven Baker. [By James Hobbs] I've been drawing the London offices of some of the companies involved with misusing our data to help bring about the rise of Donald Trump and the UK's departure from the European Union. You can find it here, on my blog. 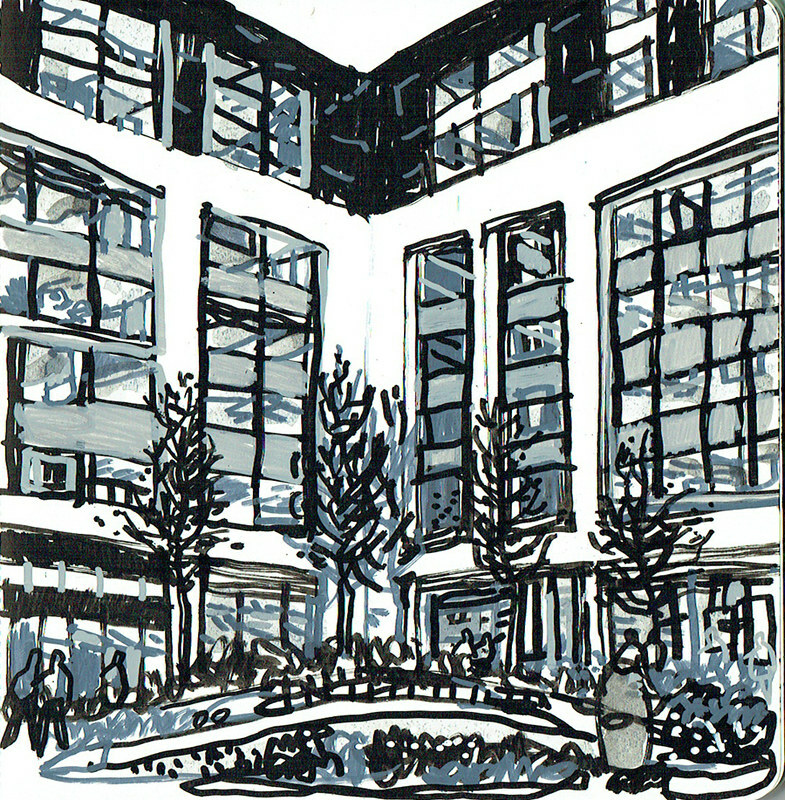 The London's Urban Sketchers Facebook page, I should add, can be found here.